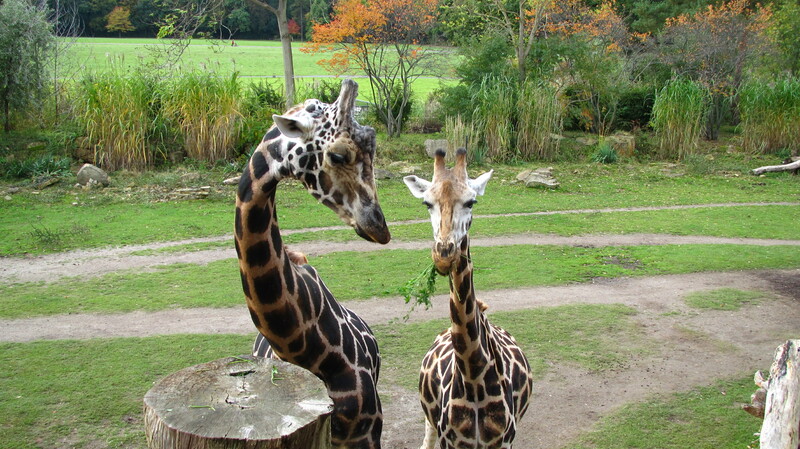 Two giraffes vie for a choice mouthful of greenery within a few feet of the viewing deck. Zebras and other ungulate species as well as ostriches shared the sweeping pastures..
I’ve been to the San Diego Zoo, the Sydney Zoo, too many aquariums to mention, and all kinds of fun places, none of which makes me an expert on how to rank a zoo, but if I were an expert, I’d rank the Leipzig Zoo way up there. It is the first zoo I’ve visited that was as intriguing for its landscape and architectural design as it was for the critters that live there. 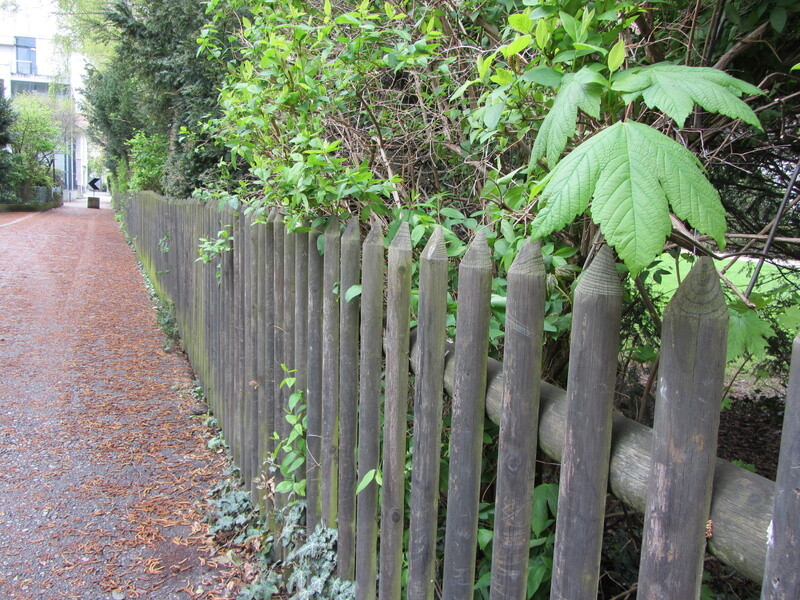 To begin with, taking a quick glance up and down the pathways, you wouldn’t be sure that animals do live there. 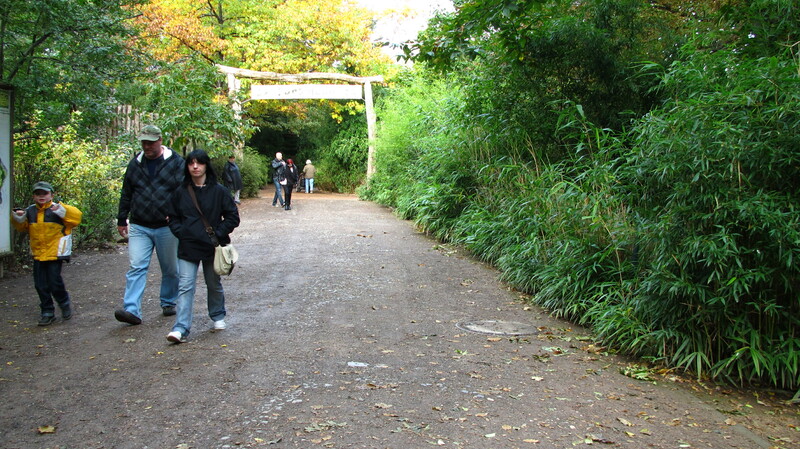 That’s because all the enclosures are shielded from the walkways with bamboo and forest greenery. 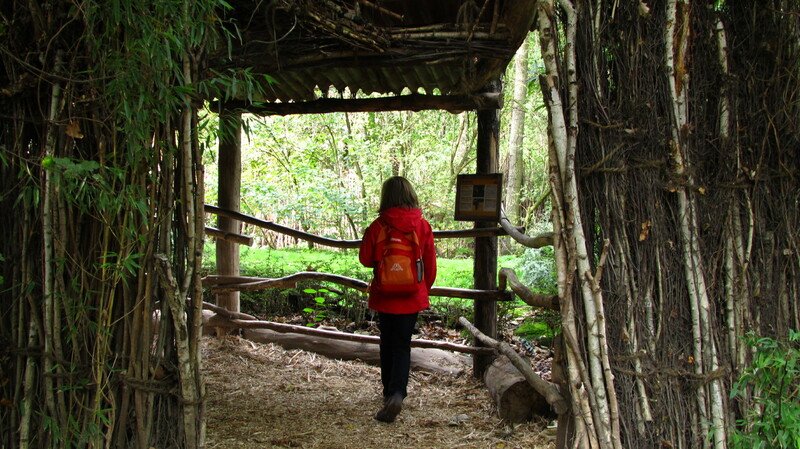 To see the animals, you have to step off the trail and into an auxiliary path, or an enclosed hut that features a soft bed of bark mulch to quiet your footsteps. In many instances, the humans seem more enclosed than the animals, as they view the animals through glass windows, which further dampens the sound of human traffic. The thoughtful set-up of the enclosures doesn’t end at the viewing platforms. The enclosures themselves are well-treed, and often you see the animals peeking around the greenery, and I’m sure they like it that way. 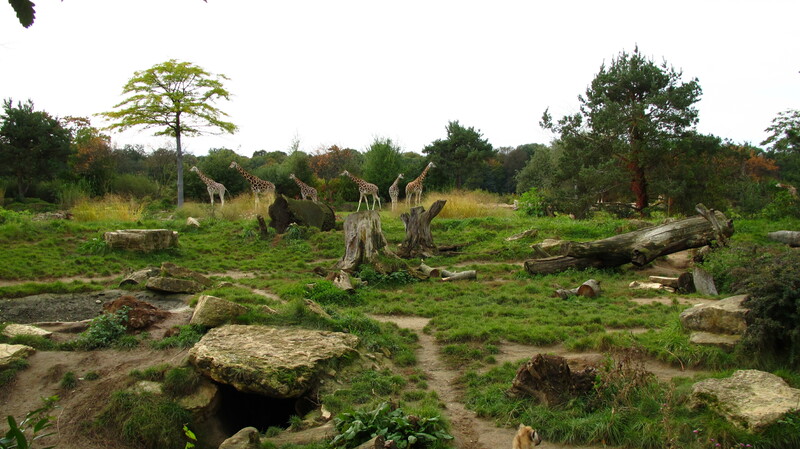 The giraffe and African plains enclosure differs, and reasonably so. Here the giraffe feeding troughs are placed at elevated heights, putting the giraffe’s heads just a little below a wide viewing platform and restaurant, giving everyone a great close-up of these lovely graceful creatures. The giraffes didn’t seem to mind the gawkers at all and moved about lazily, occasionally “fencing” with their necks over the meal which appeared to be large bunches of parsley. I could be wrong about that, but it sure smelled like parsley. 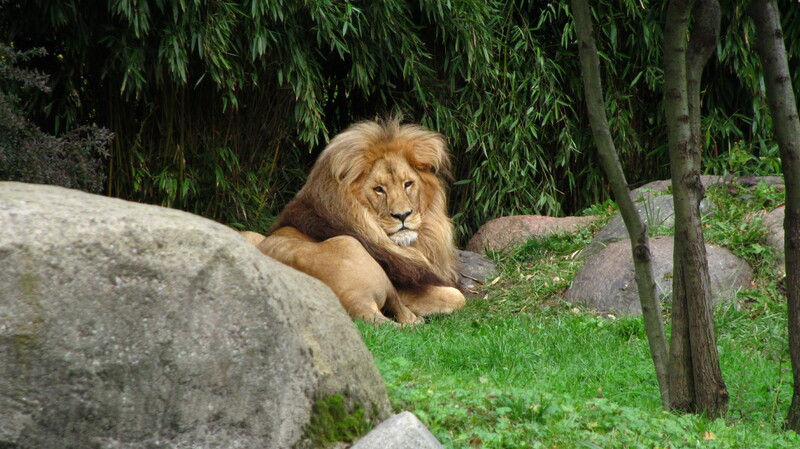 The Leipzig zoo is worth a visit, even if its pricey. 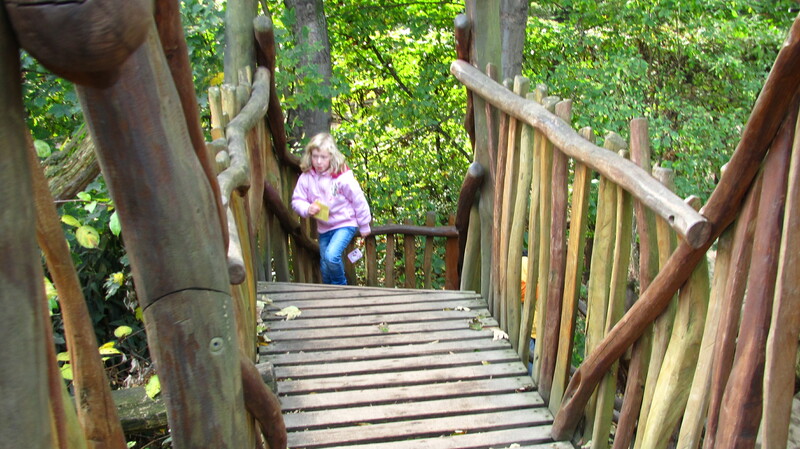 It has endless structures for children to climb, plenty of coffee and food kiosks, lots of benches, shade, and abundant parking one block over. 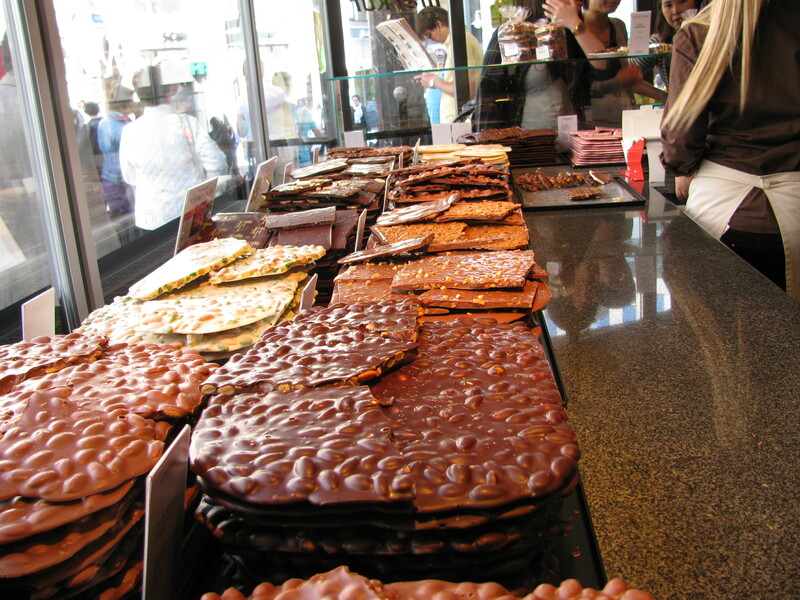 Adult price: 17 Euros, ouch. That said, by the time I finished walking through the zoo (by the way, I got lost and had trouble finding the exit, so make time for that when you’re planning your day) I did not feel ripped off. It is worth every penny. Food prices inside the gates: Reasonable. No need to pack a lunch. Washroom facilities: Plentiful, clean and some are done in funky hut styles. Time to walk through whole site and see almost everything if it’s just adults going through: 1.5-2 hours. With children under the age of 8: Three days (okay, seriously, it is an all-day zoo trip. Plan to be there for 3-5 hours). Special tip for elephant fans: Line up at the zoo gates before its 10 a.m. opening and sprint for the elephant enclosure once you get through. Do not stop to look at the weird bearded bears. The elephants bathe/swim at about 10:15 a.m. You can watch them either above water or below. It is very cool. They might bathe more often in the summer, but in October, when I was there, they skipped their afternoon bath. How do I get there? Click here for the map, and scroll to the bottom. 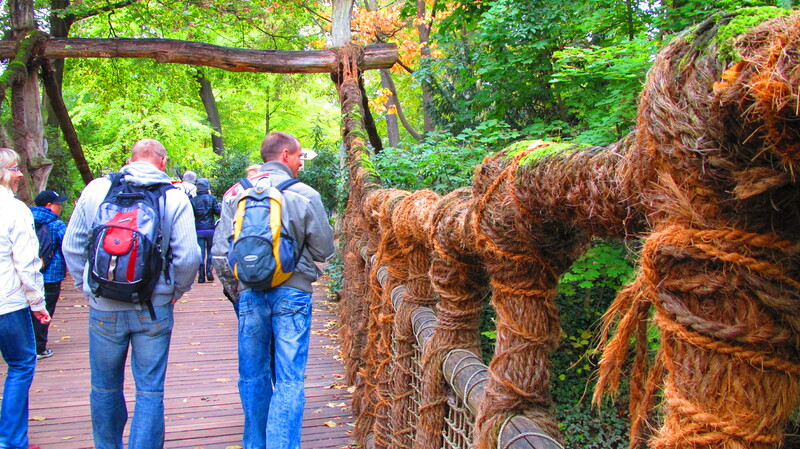 A word to the wise: The zoo features a huge jungle greenhouse called Gondwanaland. Do not go inside unless you don’t mind walking in a slow river of humanity for upwards of 45 minutes through jungle heat and humidity. Do not turn your camera on, the humidity will mess with its lenses. The path winds through the forest where monkeys swing loose, and if they land on you, don’t make a fuss, just wait for the monkey to move along. There are plenty of signs warning against feeding or trying to interact with them. Also, beware of dropping bird poop. 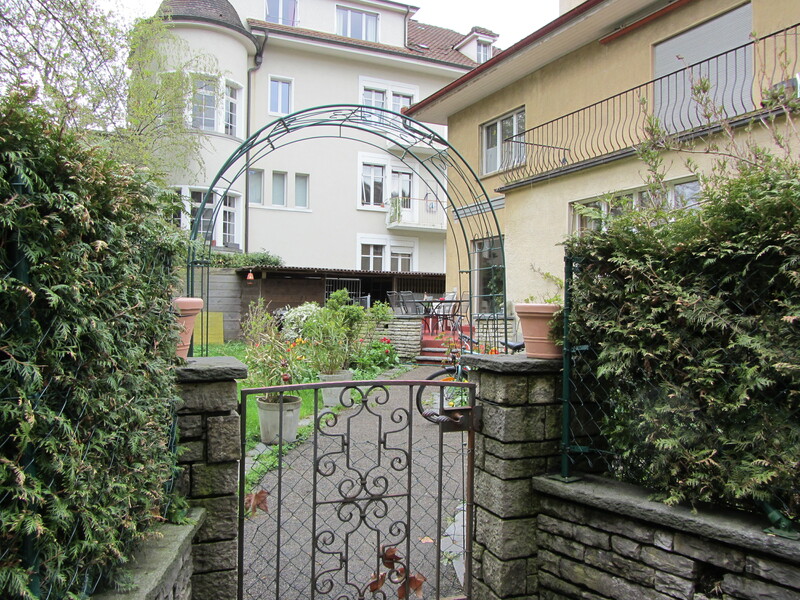 The path eventually winds up to the rooftops. It is very cool, but also very hot so I put on my reporter-face and zoomed through the crowd to get the heck out of there. It also features a river boat ride, which looked good if you wanted to melt off about 17 lbs. in 30 minutes. It all looked amazing, but the only drawback is that it’s difficult to find a shortcut out, although I eventually did do just that. If I had not, my estimate is it would have taken 1.5 to 2 hours to make it through the building. My only criticism: There should have been more staff in Gondwanaland to direct the crowds. Sometimes it wasn’t clear which way they should go, and certainly it was nigh unto impossible to find an early exit. 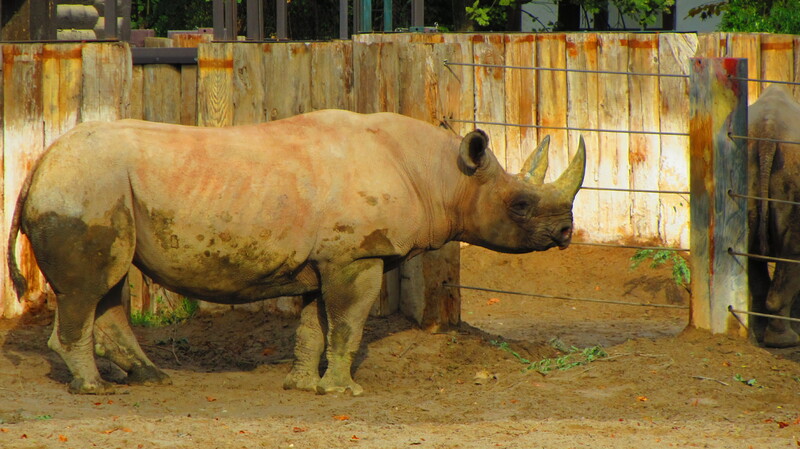 You can learn a lot more about the zoo by clicking here. Get your Google page to translate it if it turns up in German or Ukrainian. Click on a gallery photo to get an enlarged view. Fun climbing structures of all types are placed throughout the grounds. The kids loved them. This is a South American wolf. 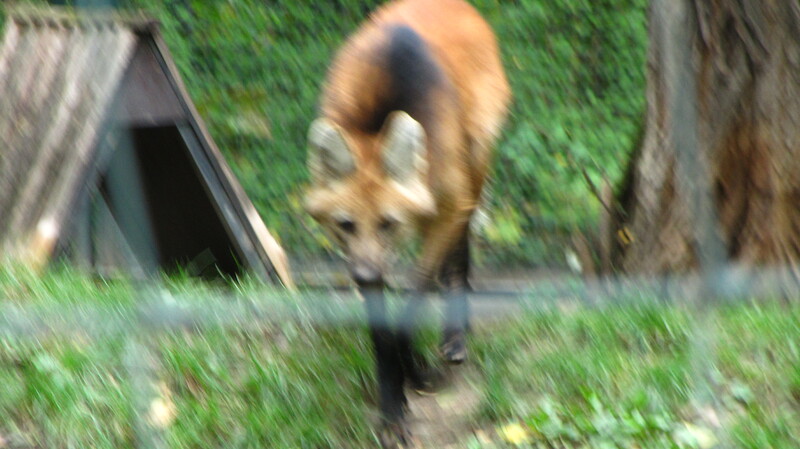 It very much resembled a fox with very long legs and was as big as large German Shepherd, maybe even bigger. 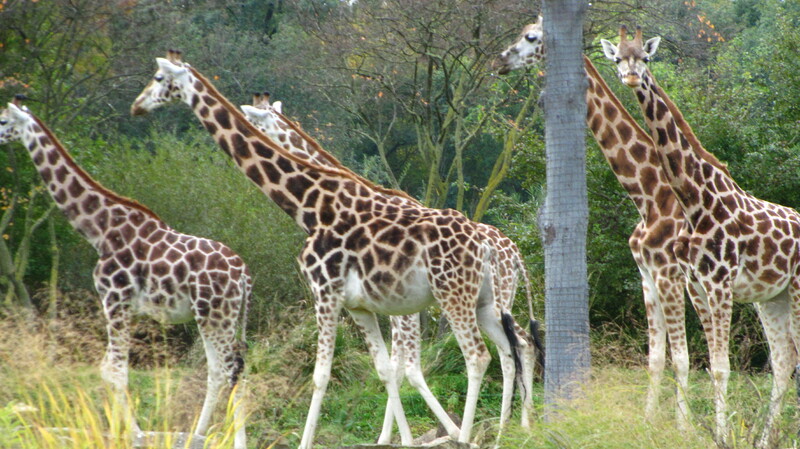 I didn’t get a full count of the giraffes but there were lots of them. You had to watch your step. 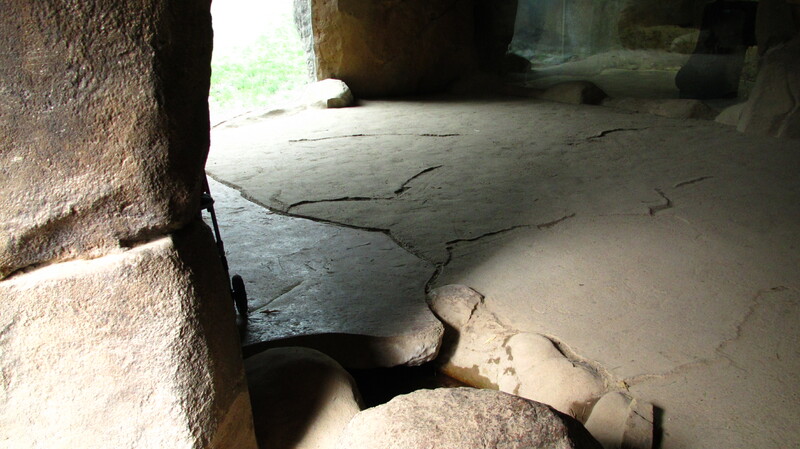 Some places were designed to look like natural stone and that included unmarked gaps. Ouch. 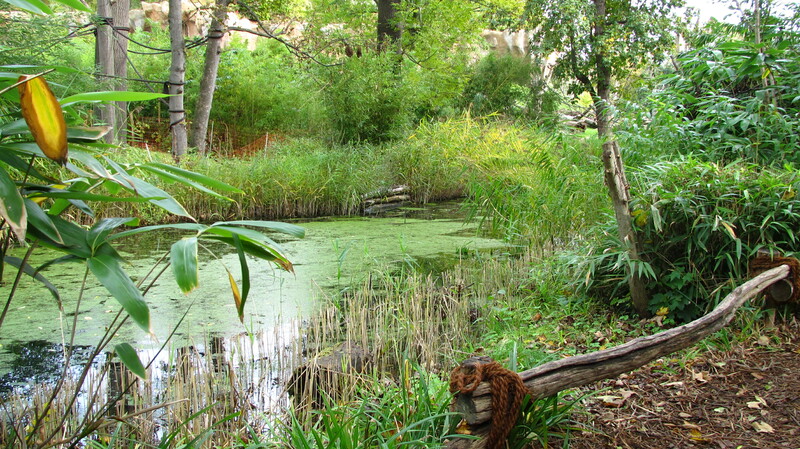 The zoo doesn’t mind having swampy grounds. The zoo is a forest. 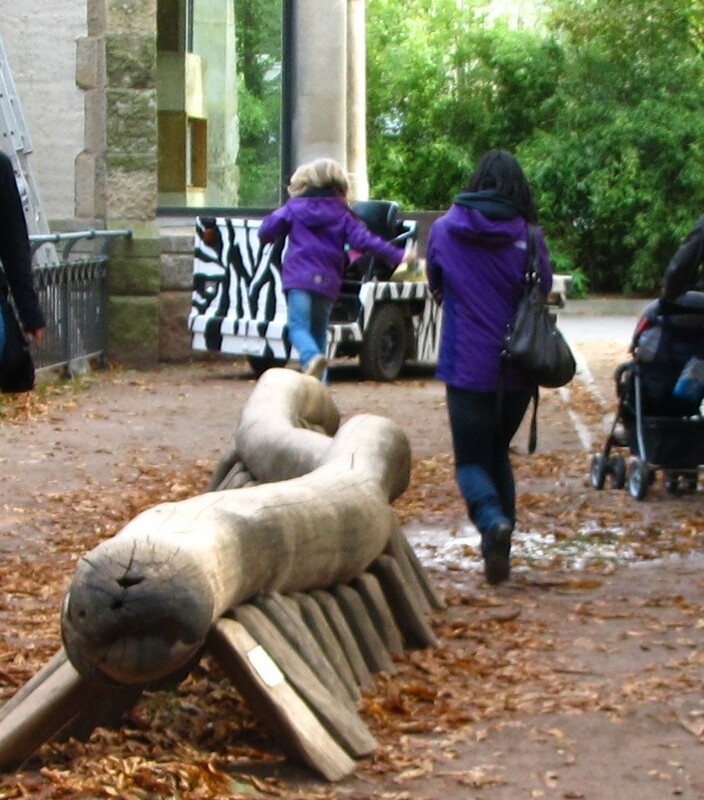 Another small gap through which zoo-goers could peer in at animals. 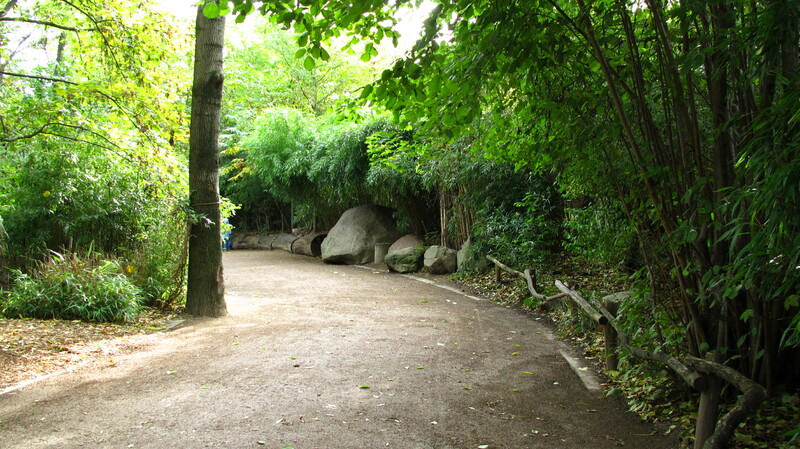 This is a typical “human enclosure” off the main path. It features soft mulched flooring and plexiglass to insulate the animals from human noise. 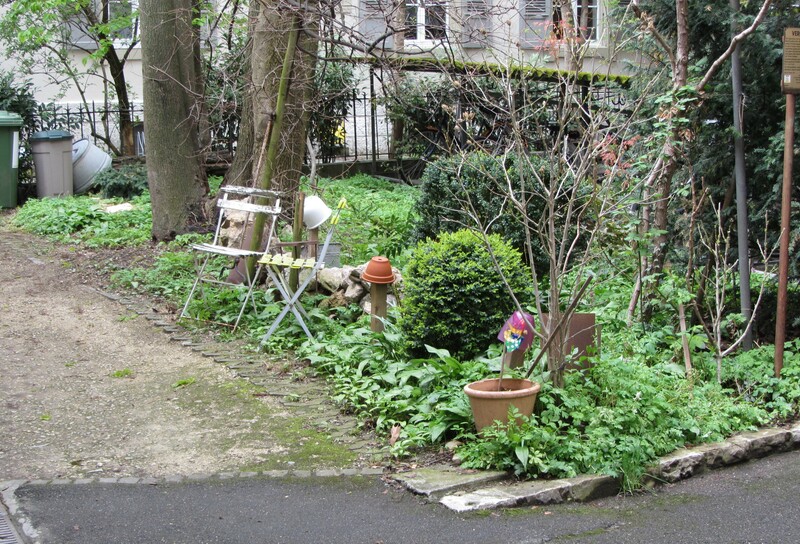 It also somewhat conceals the human activity. I wondered if the glass was one-way. 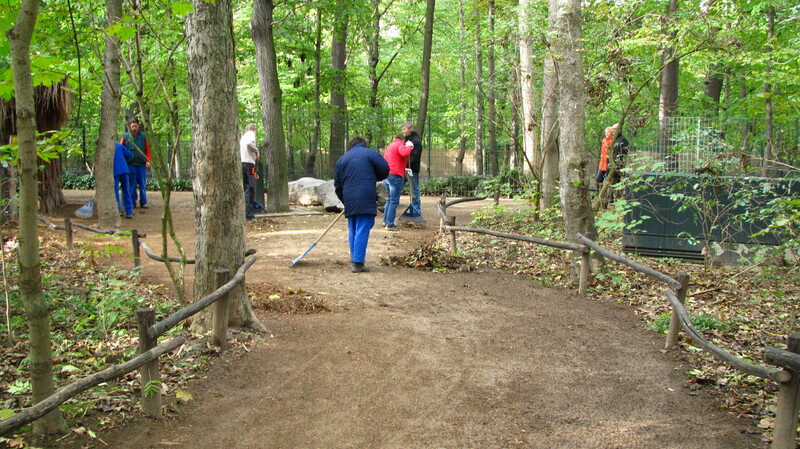 Pathways are hand-raked. The staff did not look overjoyed about this, but I’m sure the animals appreciated the quiet. 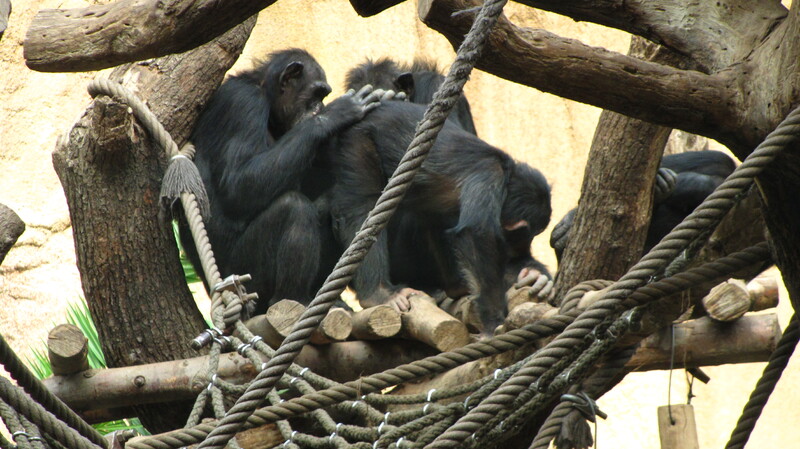 Several zoo staff were conducting intelligence tests on chimpanzees. 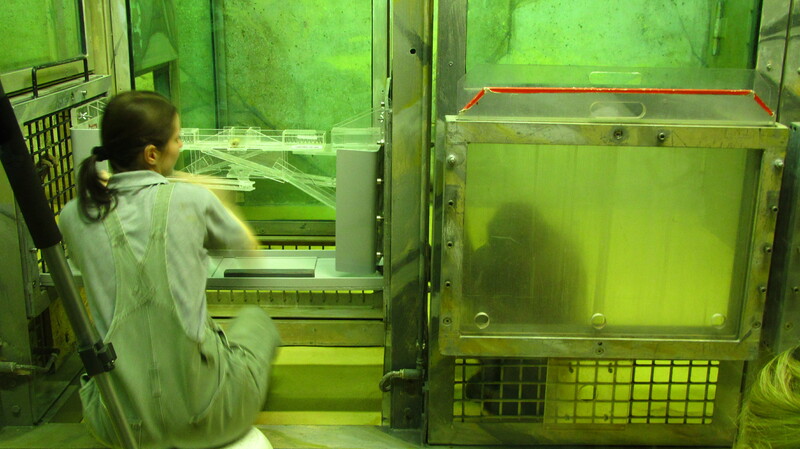 The chimps were pretty quick to pick up variations in the tests. One monkey was giving another monkey a dental check-up. It was pretty but I was a little nervous there might be crocs within snapping distance. I was wrong about that. 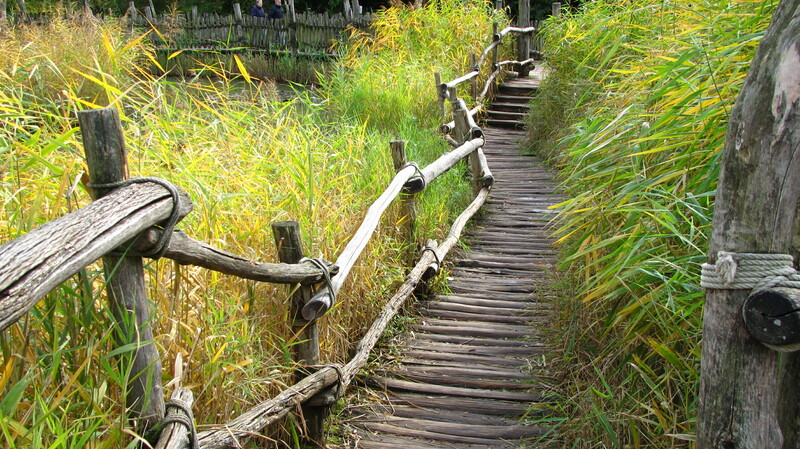 Sometimes the auxiliary walkways took you right down into the marshes. Where are the animals? 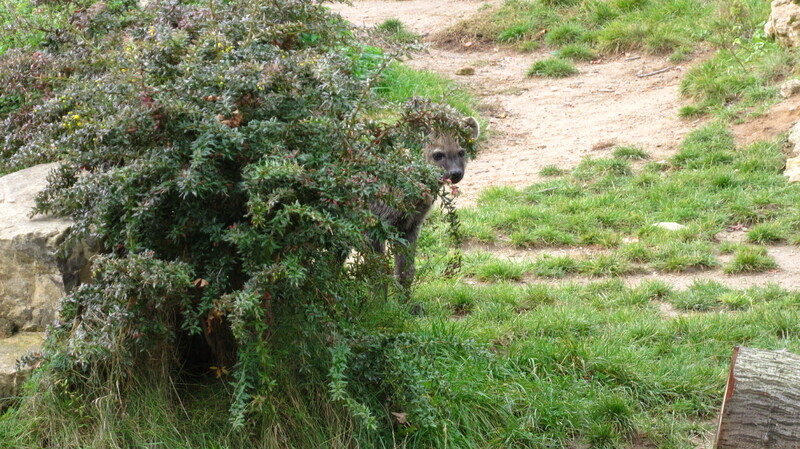 All their enclosures are hidden behind the greenery, so they are not so disturbed by the crowds. 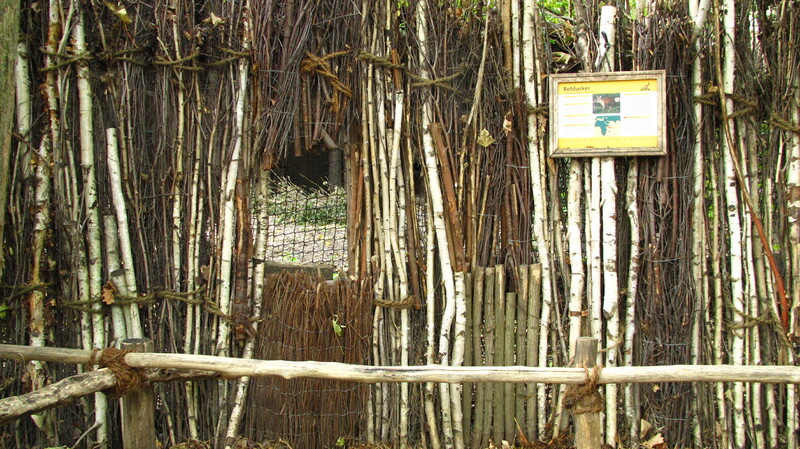 People get to climb up bamboo and wooden walkways above the animal enclosures to get a better look. Asian theme on the way to the elephant enclosures. 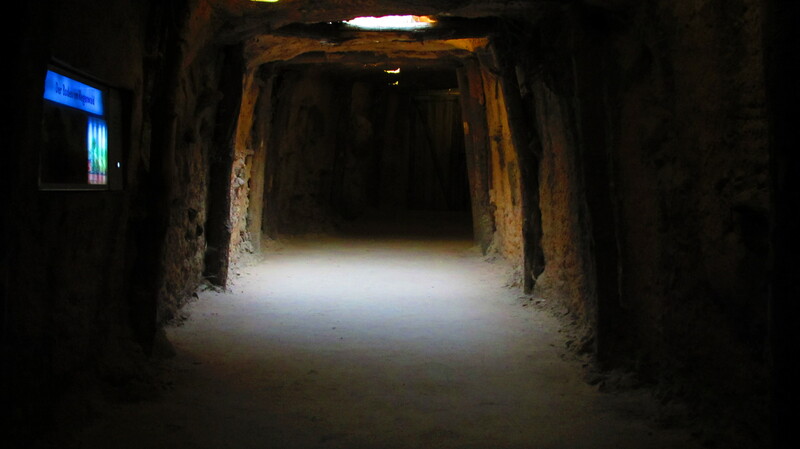 Some of the passages to the animal enclosures are cave-like and scary. 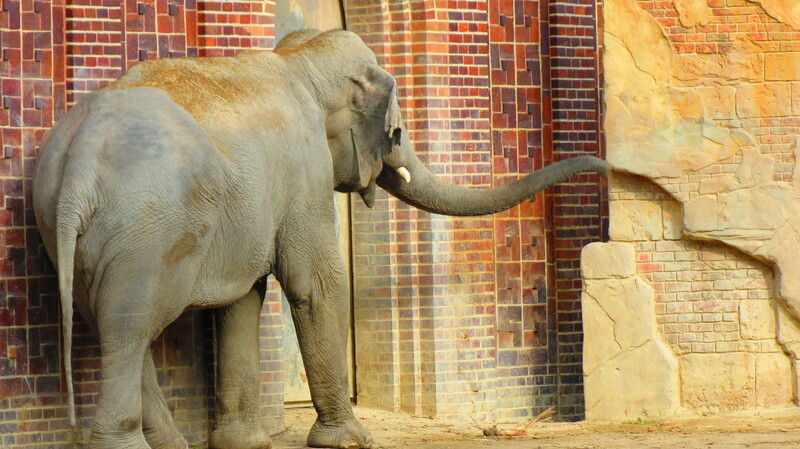 Indian elephant at Leipzig Zoo. This elephant was rocking back and forth against the wall giving himself a good scratch. Later, he and another elephant showed a lot of interest in the enclosure behind them. I think the keepers were getting their lunch ready. The zoo also has African elephants. 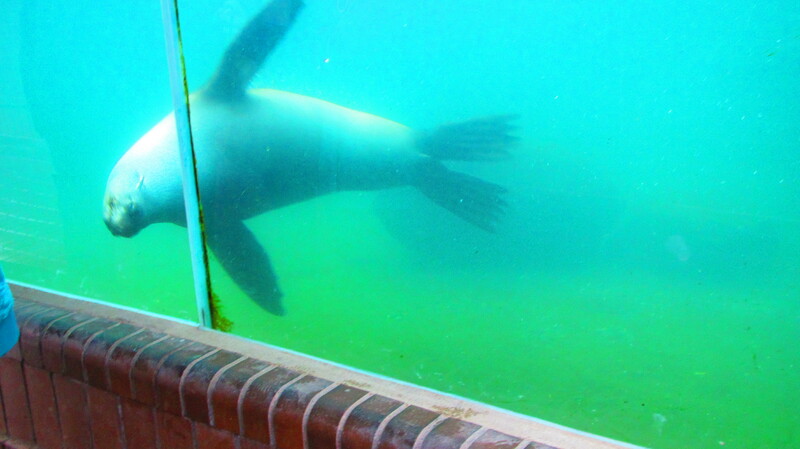 The zoo features underwater viewing for seals and other marine mammals. It also has a cool underwater viewing hall for the elephant’s swimming hole. 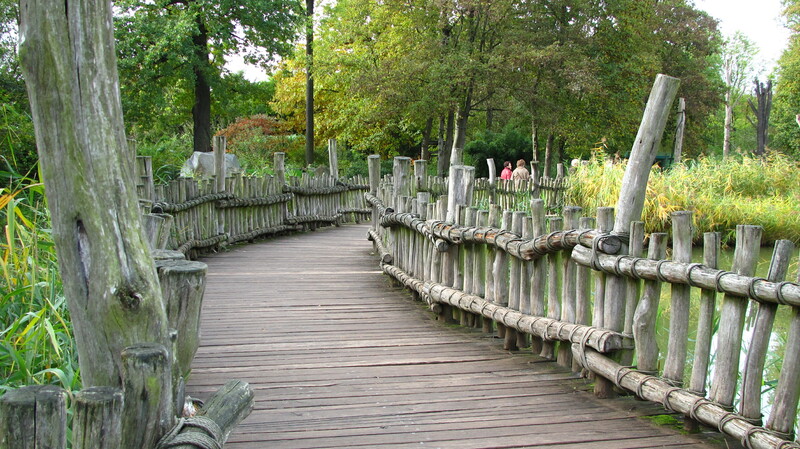 This bridge features a jungle design. 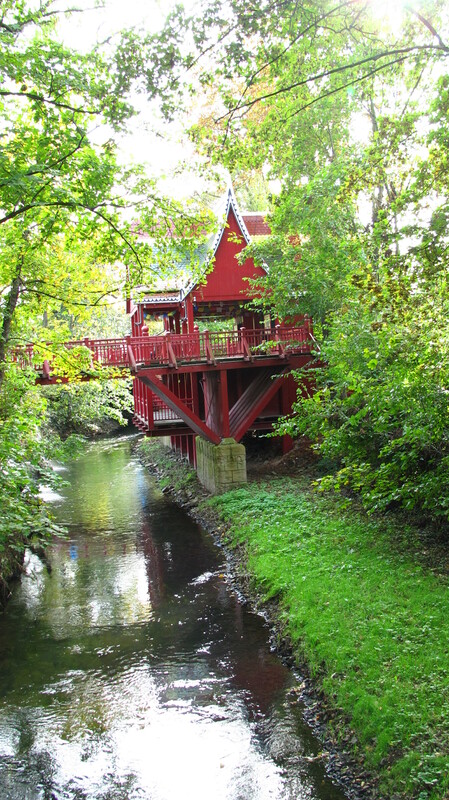 Other bridges followed other themes, such as the Far East. 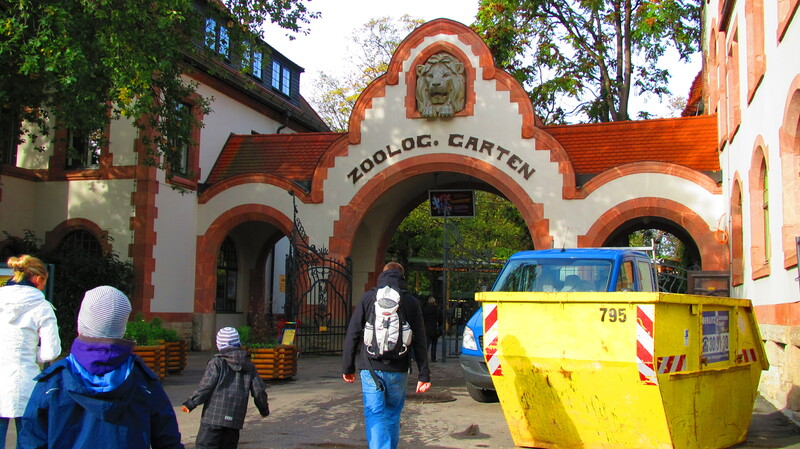 The Leipzig Zoo gates. I post this picture in case you try to find it and can’t. This is what you’re looking for. 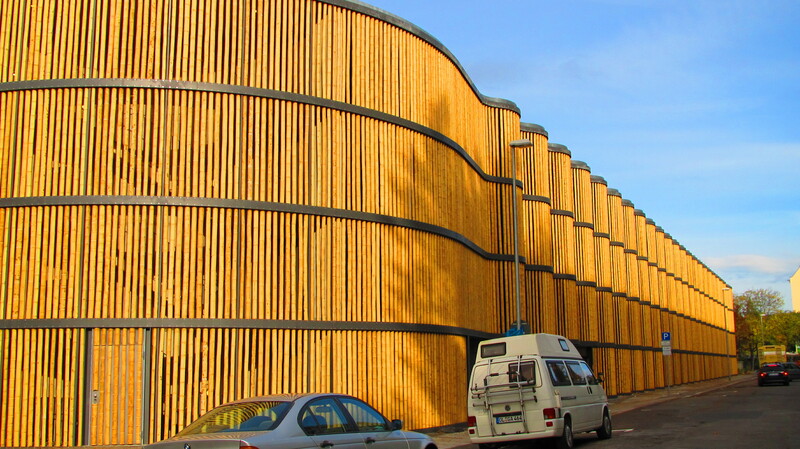 Leipzig Zoo parkades are walled in undulating rows of bamboo set into metal frames. Very cool. 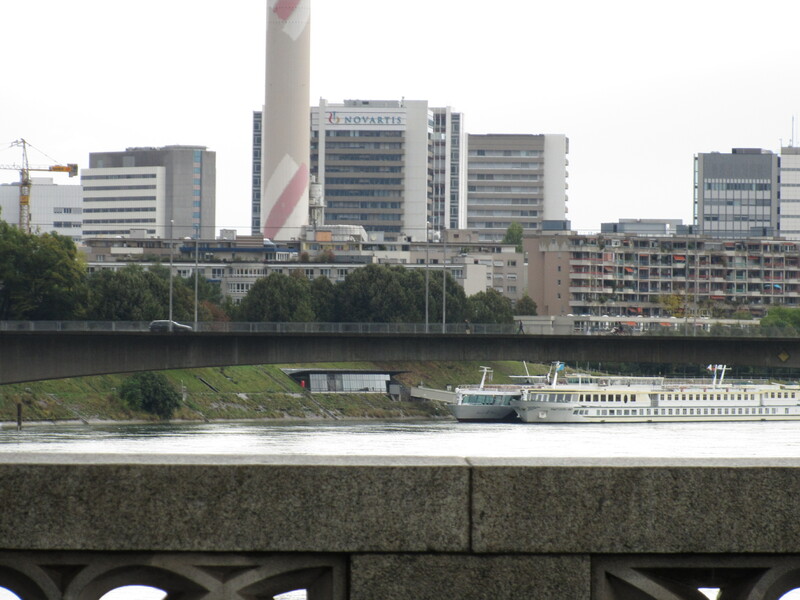 Looking north from a bridge over the River Rhine. 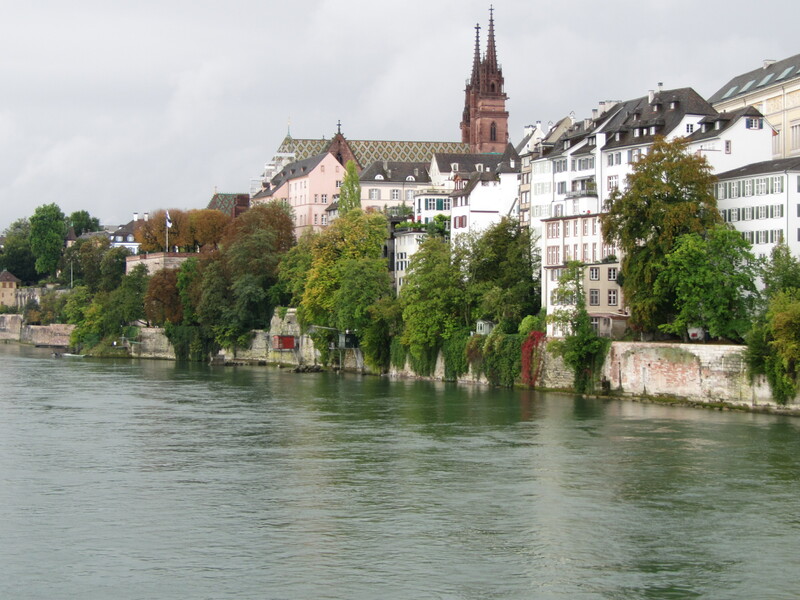 Despite the many beautiful medieval sites to be seen in Switzerland, it is a modern country loaded with modern industry including two of the world’s five largest pharmaceutical companies – Novartis and Roche, which happen to have their headquarters in Basel, a split-personality city that is perhaps best seen from this bridge where a look northwards shows a modern city, and a look south reveals a medieval metropolis complete with the red sandstone Basel Munster. Looking south from the same bridge and it's like being in a different century, as well as a different city. Instead of launching into my usual diatribe about the horrors of modern architecture, even though my point is so well-illustrated in these photos, let’s discuss the church. 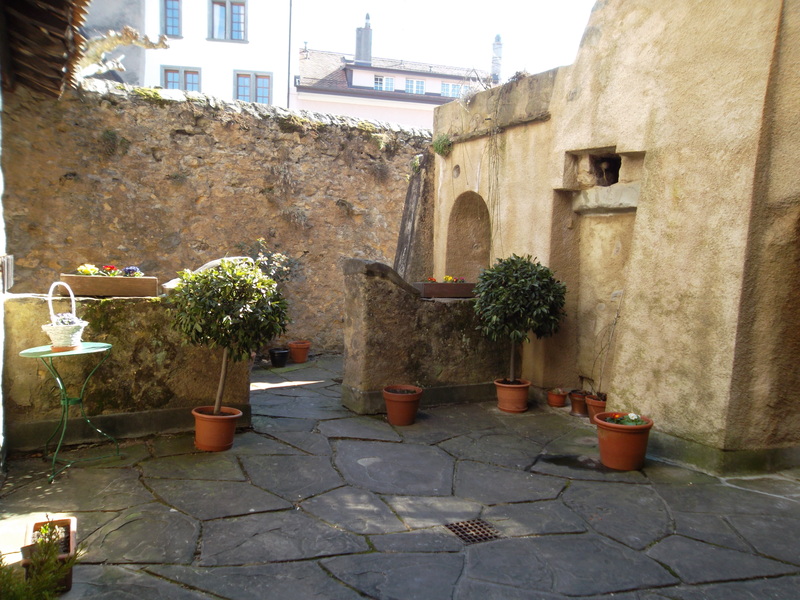 The Basel Munster was originally built between 1019 and 1500, and if you’ve ever served on a church building committee, you are now reeling back in horror at the thought of how long the Baselite building committee meetings must have lasted. There must have been some argument over the colour theme in the stain-glass windows. It didn’t matter anyway, because it all came down in a massive earthquake in 1356, which may have been an Act of God of which the Swiss took note because they hurried up the rebuild and consecrated the church’s new altar by 1363, with much of the building proper completed by 1500, which is still more than a 100 years in the making, but a darn sight faster than the first 337 years of construction. Shard from the pre-earthquake church that stood on this site. We don't know what that inscription is beneath it - possibly it marks a crypt. If you speak German or Latin, please enlighten us. 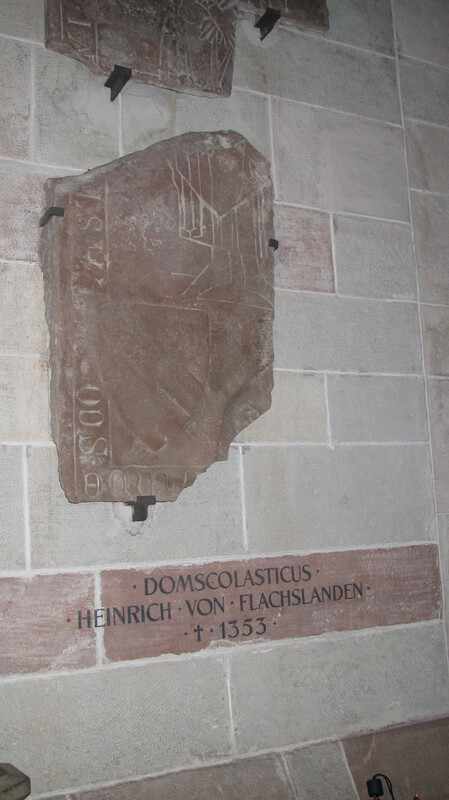 For those surprised to learn of a 6.2-richter earthquake capable of taking down a stone church as well as reportedly every castle in the area, occurring right in the middle of Europe – me, too. I was stunned. 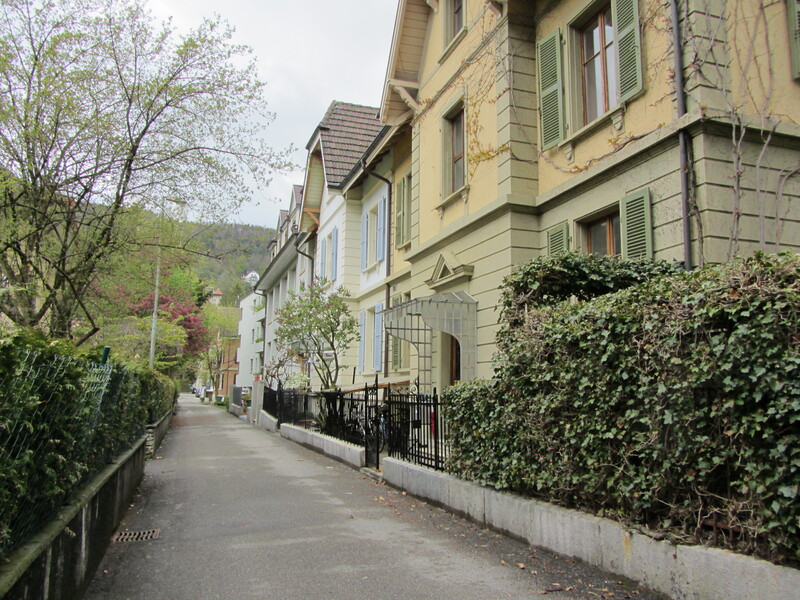 Hence, Switzerland has a Seismological Service, because if the Swiss are capable of anything, it is being prepared for the next natural disaster. They don’t have enough of their own, which is how they come to export their disaster teams/philosophy in the form of the Red Cross. There have been 10,000 earthquakes here over the last 800 years, say the Swiss seismologists, that’s about 12 a year or one a month. We have not felt any as yet, although of those 10,000 only six have registered over 6.0 on the Richter scale. 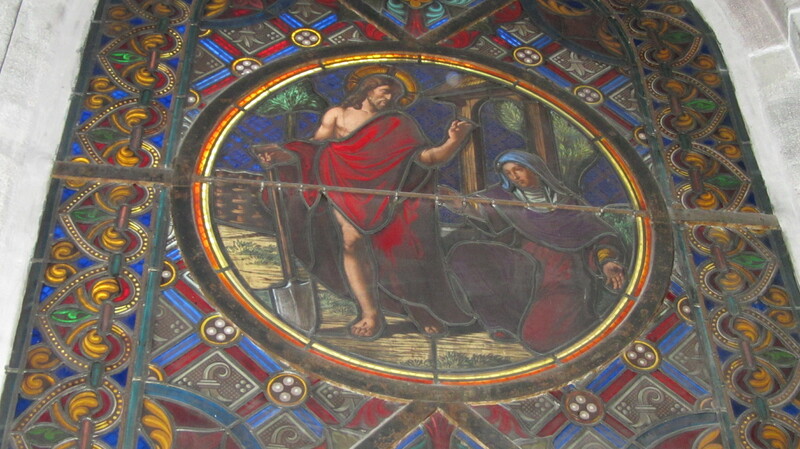 Jesus with a shovel. Someone please explain this to me. Speaking of stain glass windows, we found one depicting Jesus holding a shovel, and while Dave and I are not Bible scholars, we have both read the Bible making us something of a rarity in some social circles, and we cannot bring to mind any scriptural reference to Jesus shovelling, gardening or ditch-digging. And yet, here in a medieval church that started out as Catholic and eventually moved on to become Dutch Reformed is Jesus with a shovel. I can’t explain it. If you can, please comment.